Which Annoys You More: Asian tiger mosquitoes, ticks, or stinkbugs? The Frederick News-Post recently conducted an on-line poll asking which pest is more annoying. Since it was August, they chose to find out if their readers thought cicadas or stink bugs were worse. How curious, we thought. The surprising result was that only 71.6% said stink bugs were more annoying. It would have been more, but 24% said they were equally annoying. Judging by the calls we get from people anxious to get rid of stink bugs, which have been labeled by government officials as the “perfect pest” because they can annoy year round by invading your house in the fall, coming into your home and annoying you all winter, and then coming out again in the spring to hang out on the outside of your house (and start breeding), and then eat the farmers’ crops in the summer. The 29.6% who did not say stink bugs hands down must live in the parts of town where they hardly ever see stink bugs. If we were to conduct a poll, we would ask which is more annoying, stink bugs or Asian tiger mosquitoes? The answer would vary by the location of the homeowner. Some might say they are equally annoying because they can’t be in their yard for five minutes without getting eating alive and at the same time have thousands of stink bugs trying to move into their house. But to us, that would be a much more interesting question. Of course, we don’t want to forget the other serious pest control issue in our region: the deer tick, which has infected thousands of people with debilitating bouts of Lyme disease. We at Mosquito Squad of Frederick dislike them all equally. Even one mosquito, tick or stink bug can make our skin crawl; that’s why we love killing them. With stink bugs destroying crops, Asian tiger mosquitoes transmitting West Nile and Chikungunya, and deer ticks transmitting Lyme disease, we can certainly find reasons to enjoy helping people get peace of mind knowing that they don’t have to put up with those pests. Our barrier spray will take care of all of them. After a barrier spray, there will be no more annoying Asian tiger mosquitoes, deer ticks or stink bugs in your yard to annoy you. On October 28, 2011 I attended a conference for pest control professionals where the brown marmorated stink bug (BMSB) was the main topic of discussion. Some highlights from the conference. The University of Maryland says that exclusion is the best way to control stink bugs. In other words, they suggest that homeowners simply seal their house. Many of our customers report having tried everything to seal their homes, but their homes were still infested with stink bugs. Sealing your house can only get you so far. One of my customers told me that he heard a BMSB can shrink down to the size of two pieces of paper stacked on top of each other. The BMSB can enter your home from various places, including vents, chimneys, windows, under the siding, the eaves, doors, etc. Of course, sealing the house only gets you so far. I have met several people who stopped using doors to their homes because they knew that if they opened that door, stink bugs would come in in droves. What good does it do to seal a house, if they swarm into your home when you open a door to go in or out? The University of Maryland extension recommended that homeowners simply use a vacuum on any stink bugs that enter their home. If you choose to do this, you run the risk of ruining the vacuum for any other purpose because the vacuum will smell horrible and, if you have a large infestation, you will spend hours a day vacuuming. Many of my customers have reported that before they called Mosquito Squad of Frederick they would spend hours a day vacuuming up stink bugs during peak periods. Our experience confirms that it is best to keep them out. We find that our comprehensive treatment has helped hundreds of happy customers live without stink bugs invading their homes. To see one customer’s video testimonial click here. To see another, click here. We just found this article in the Courier-Post out of Southern New Jersey. Not only does the article say that we should expect billions of stink bugs this spring, it actually suggests that they will start mating later this month. Our information is similar to the articles, except that we anticipate that the stink bugs will start mating in the spring, perhaps April or May. If the weather stays warm the rest of the winter, perhaps they will come out sooner. You may want to get some stink bug treatments in the spring to prevent as much mating as possible. I found it interesting that the person they chose to quote about how bad his stink bugs are happens to live right here in Frederick. The article says “In his 90-year-old farmhouse south of Frederick, Md., Doug Inkley is already under siege. He’s a biologist for the National Wildlife Federation, and he loves bugs.” Poor Mr. Inkley has actually counted the number of stink bugs that he has vacuumed up inside his home, more than 12,000 since January. According to the article the brown marmorated stink bug, plaguing this area, are at least one bug he does not like, or love for that matter. – Vacuum them. This also will help kill stink bug eggs. But dispose of the vacuum bag, maybe dousing it with some insecticide as you set it in the trash can. – Attract them. Use a wide-mouth can. Fill with an inch of water, sweet-scented dish soap, and a little cooking oil on top. Make sure that pets cannot lick this trap. The sweet smell lures the bugs; the oil smothers their discharge; the soapy water smothers them as they sink. – Exterminate them with commercially available insecticides. But apply the chemicals outside. If you do so when they are in your walls, you could attract carpet beetles that feed on their carcasses and potentially your woolens. (At Mosquito Squad, we use a product that kills the stink bugs as they land on the treated area for two to three weeks, and sometimes longer. This product is only sold to certified applicators.). – Repel them. They don’t like the smell of garlic – if you can handle it. – Block them. Caulk small openings and cracks in your house or elsewhere to keep them out of structures. Repair damaged screens. Sources: Penn State University College of Agricultural Sciences, city of Burkittsville, Md. People have been telling me recently that they are starting to notice stink bugs in their house in the first week of January. As one person put it, it got a little warmer and now I am seeing them in my house. They wonder why that is. Others have asked me about the stink bugs’ life cycle. I thought I would share this information for anyone who is interested. Stink bugs are generally hatched in August. In September they notice that the temperature is getting colder so they start coming to your house to overwinter. They continue being heavily concentrated around certain homes, mostly in more rural areas near soy or corn farms or wooded areas, from September to November. By mid November the temperature has dropped enough that the stink bugs are inside where they will hibernate, or as some have called it, semi-hibernate. As it gets warmer to the stink bugs, they may start to get more active indoors. 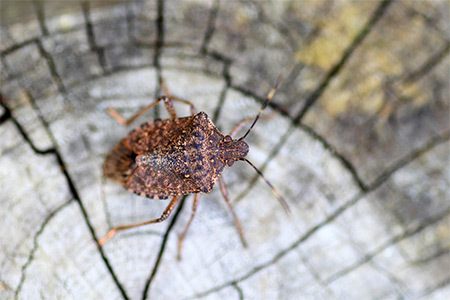 Though one of my customers told me that they saw stink bugs outside their home last February after the major snow fall. In April and May, they will start going outdoors. That is when they will mate. So, when is the best time to treat for stink bugs? Some may want to treat in April thru June to kill them before they breed and lay eggs. Definitely, from August through October is the time to treat to keep as many as possible out of your house.